In between creating pictures my world is consumed by re-watching Game of Thrones with Artem as a recap before the new season starts. It’s amazing how much you notice knowing more of the story now that happened earlier on and also side stories and scenes that I seemed to have missed the first time around. The uncanny part is the scene’s I don’t remember also seem to be the same ones that Artem doesn’t recall either. We think we’ll get to the Red Wedding episode today and who doesn’t look forward to a ‘bloody’ wedding? 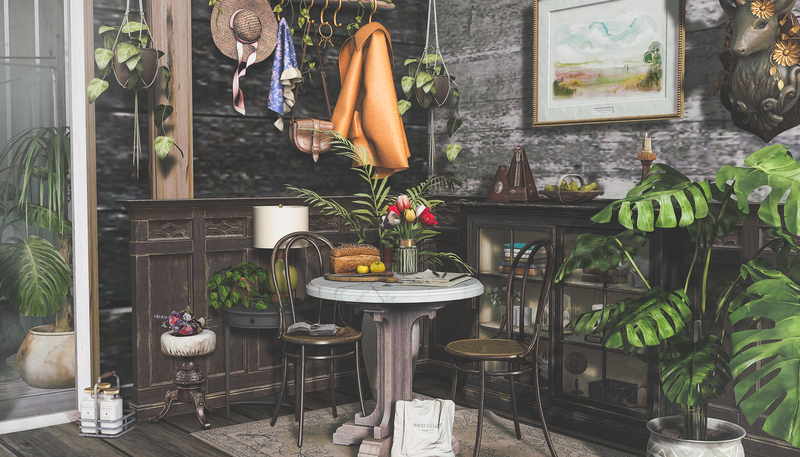 Today I am featuring new items from Apple Fall under the new West Village sub-brand he has created. Apple describes the new brand as “…and adaptation of Apple Fall in the way that it extends and enhances the Apple Fall experience into something new for 2019.” The set is gorgeous and has all the details and options that you’d expect from Apple Fall. All the details are in the credits below. Lovely work, Kess 🙂 You know, G.O.T…. I never thought they’d be able to translate the novels into a viable TV series because there is so much in them, plots… sub plots… plots you thought weren’t plots at all! But finding the right actors went a long way towards getting it to flow. Honestly seeing so much I missed first time around. I read the first book but none of the others yet. I think I might still have a read of them after the TV Series is done.